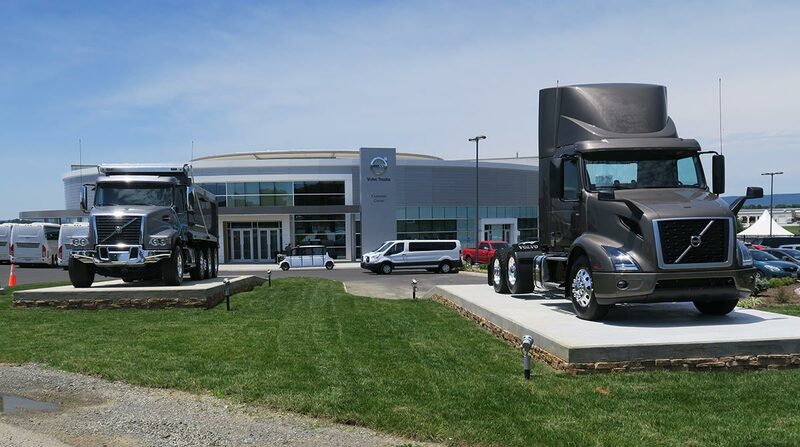 DUBLIN, Va. — Volvo Trucks North America has opened a new customer center here to educate visitors about its products, and it features proving grounds for testing its trucks. The facility shows off everything from cutaways of sleeper berths for the manufacturer’s new VNL-series tractor to kiosks with built-in steering wheels where users can learn firsthand how navigate the driver information screens and wheel-mounted controls on the VNL- and VNR-series trucks. “We are very pleased to open the Volvo Trucks Customer Center, which we believe will serve as a destination for all of our North American customers and other visitors,” said VTNA President Goran Nyberg. The company gave media tours July 10-11. Nyberg and Claes Nilsson, global president of Volvo Trucks, were on hand for the event, which kicked off with the unveiling of the redesigned VNL series. The executives, and other Volvo staff, discussed cab designs, seating options, safety, maintenance and fuel efficiency, and were then given the opportunity to drive VNR and VNL models. For the VNR, a short course with tight corners was set up at the facility to represent the city deliveries customers of these trucks often make. The 1.1-mile, banked two-lane course for the VNL featured sweeping curves that provided an opportunity to sample how it handled the loaded dry van and tanker trailers that were hooked to the five test trucks. The course is long enough to enable highway speeds and features numerous surfaces and grades to let drivers experience different road conditions in a designated off-highway area, Volvo said. Volvo broke ground in 2015 on the 36,000-square-foot customer center. It is shaped like the Volvo iron mark logo and is part of a $38.1 million investment in the Dublin facility, where all of its trucks for North America are assembled. In addition to the customer center, the investment funded several plant upgrades focused on safety, quality and efficiency. “This new facility recognizes the tremendous contribution that [our] employees deliver to the trucking industry and our customers,” said Franky Marchand, vice president and general manager at the plant. The Dublin plant is Volvo’s largest in the world. The customer center also includes a theater in the center of the building that seats 290 visitors, revolves and has an 82-foot turntable. “Now, our trucks, engines and transmissions are all spotlighted in one location, in a one-of-a-kind facility designed to offer a unique brand experience,” Nyberg said.